Nara Institute of Science and Technology (NAIST), Japan, awarded Professor Jiayang Li of Institute of Genetics and Developmental Biology (IGDB), Chinese Academy of Sciences, an Honorary Doctoral Degree on November 7 for his scientific achievement and enthusiastic support to the Global Centre of Excellence (Global COE) program. The Global COE program hosted by NAIST promotes Ph.D. student exchange among University of California-Davis, IGDB, and NAIST. 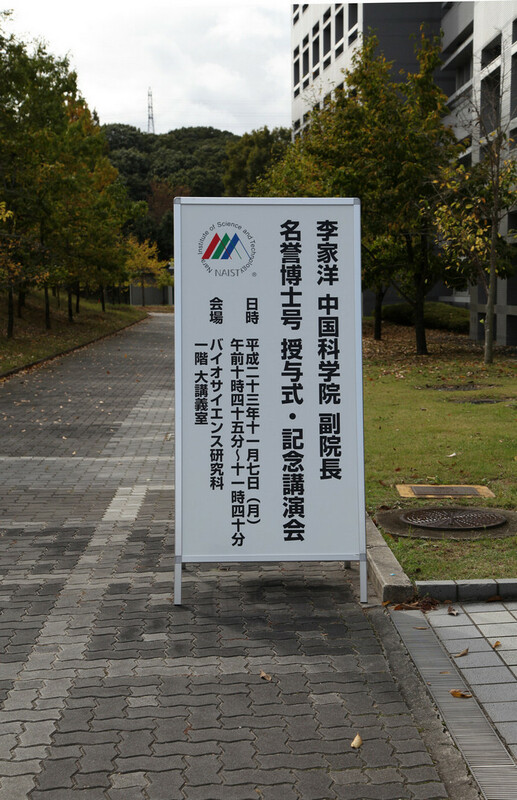 The Honorary Doctoral Degree is given to prominent scientist who has contributed greatly to promote the internationalization of NAIST. 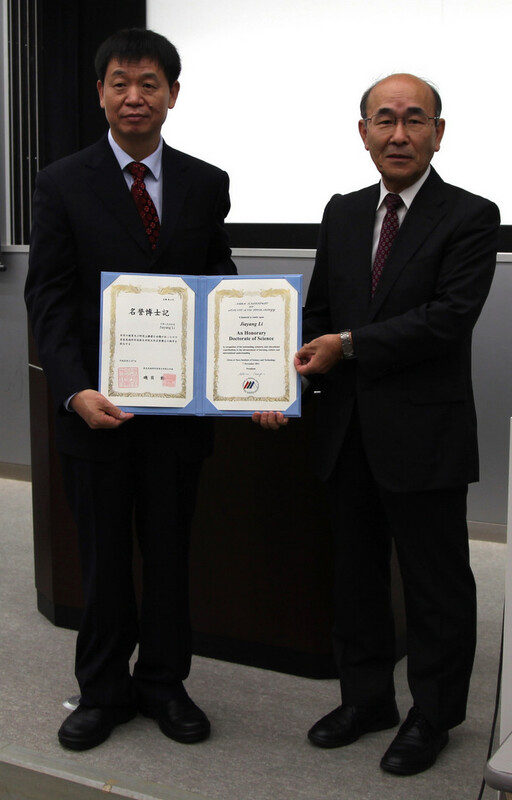 Professor Li is the third recipient of the NAIST Honorary Doctoral Degree. 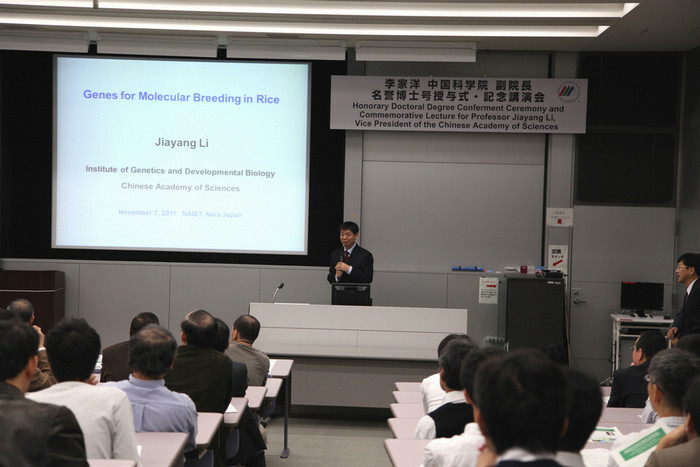 Professor Jiayang Li is a prominent Chinese plant geneticist who dedicates his research in improving rice yield and quality. He has made many discoveries in understanding the genetic control of rice architecture, grain quality, and stress response. His work has been published in world renowned journals including Nature, Nature Genetics, PNAS, and Plant Cell. Dr. Li’s laboratory is mainly interested in molecular genetics of plant development and metabolism, focusing on the elucidation of molecular mechanisms underlying plant architecture and the starch biosynthesis in rice. 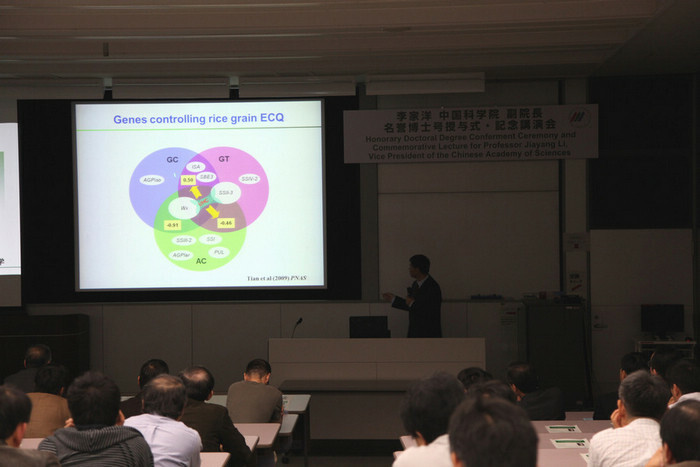 His lab is also interested in breeding super elite rice via molecular design. Dr. Jiayang Li received his Bachelor Degree of Agronomy from Anhui Agricultural College (now Anhui Agricultural University) in 1982, Master Degree of Science from Institute of Genetics (now IGDB) of Chinese Academy of Sciences in 1984, and Ph.D. of Biology from Brandeis University, USA, in 1991. After completing his postdoctoral research in Dr. Robert Last’s lab at Boyce Thompson Institute for Plant Research at Cornell University, Dr. Li, as a professor of plant molecular genetics, joined Institute of Genetics, Chinese Academy of Sciences in 1994. Dr. Li was elected Fellow of Chinese Academy of Sciences in 2003, and Foreign Associate of the American Academy of Sciences in 2011. He became the director of Institute of Genetics in 1999 and IGDB in 2001, vice president of CAS in 2004.